Is your home missing something? If your floors are old and you’ve had them for many years, then you’re missing out on some impressive and affordable flooring options. At our large flooring store, we have a wonderful solution: vinyl sheet flooring! Our huge showroom is stocked with an endless array of vinyl flooring in many colors and patterns. Whether you want to select something that is traditional, unique, or modern, you can depend on finding all that you need at our store to make over the flooring in your home. Vinyl flooring is a popular flooring option due to its beauty, resilience, and cost-effectiveness. Lauded as a versatile choice, vinyl is available in many different types to accommodate your design goals. Vinyl sheet flooring provides full coverage and is easily shaped to fit your needs. Vinyl tile flooring has dazzling patterns, and vinyl plank flooring emulates other flooring materials, such as hardwood. No matter your preferences, we make it easier for you to pick the designs and patterns you want to create a unique interior. Do you like the look of hardwood or stone floors? Our vinyl flooring store offers a low-budget alternative: vinyl tile and plank flooring. We have a variety of styles that look just like real wood and stone. Available in many different colors as well as top-selling wood species, such as cherry, maple, oak and chestnut, you will find a vinyl floor that mimics other natural flooring materials. Looking for an interior space that imparts elegance and a feeling of timelessness? We recommend vinyl tile flooring. Also known as luxury vinyl tile (LVT), this option is available in a variety of colors and designs. Tile flooring empowers you to mix and match to create a unique style that’s all your own. So, whether you are planning a room for Old World appeal or a more contemporary spin, vinyl tile allows you to coordinate the appearance you want at a fraction of the cost. You deserve a beautiful floor that keeps up with your active lifestyle. For this reason, we offer durable and stylish vinyl sheet flooring at our showroom. Vinyl sheet floors are available in a wide variety of patterns and designs. In fact, contemporary printing methods have enabled vinyl to include different textures for a better feeling underfoot. Vinyl sheet flooring may be cut and shaped according to the unique measurements and contours of any given room, providing a seamless appearance that will impress guests and family alike. Of course, you can depend on sheet flooring to stay beautiful and resilient throughout your everyday activities and for years to come. The look and feel of hardwood surfaces is yours when you invest in vinyl plank flooring. Vinyl plank is another variant of “luxury vinyl” that imitates the appearance of oak, pine, cherry, and redwood. Specially cut to resemble the appearance of wood flooring, vinyl planks establish a distinct atmosphere for your favorite rooms. On top of that, the water-resistant properties of vinyl make it perfect to install in kitchens and bathrooms. Make the process easy – from selection to installation – by trusting our team of installers. 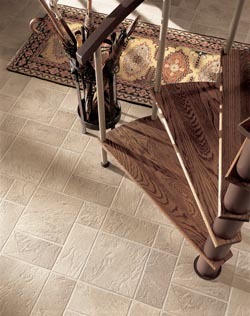 Our showroom also coordinates complete vinyl flooring installation services for your convenience. As specially trained flooring technicians, we carefully measure the flooring space, remove the old flooring, and place your new floor in an accurate and timely manner. On top of that, your purchase is backed by our industry-recognized Ultimate Confidence Guarantee. If you are not satisfied with our workmanship, then we will rectify any errors at no additional cost to you. Contact us today to request an estimate for your new vinyl flooring. We proudly serve the communities of New Haven, East Haven, Branford, North Haven, and Hamden, Connecticut, as well as the surrounding area.